When 2001: A Space Odyssey was released, critics and audiences were divided. Some hailed it as a tremendous achievement while others found it indulgent and obscure. Over time, the movie has come to be recognized as one of the greatest films ever. While it’s too soon to say how Interstellar will fare in the long run, director Christopher Nolan’s bid to do his own 2001 will undoubtedly divide viewers as well. Count this reviewer among those who think this is the best science fiction film of the year. It’s the near future. Our destruction of the Earth is nearly complete with animals and plant life falling to extinction, and corn seemingly one of the last crops hanging on. Cooper (Matthew McConaughey) lives with his father (John Lithgow) and two kids on his farm, although he was an engineer who had worked for NASA. Not only is there no space program. Students are now taught that the moon landing was faked. Cooper learns otherwise and finds himself on a desperate mission through space. There is a stable wormhole that will allow us to go to another galaxy and find a new planet for humanity. However when he and his crew get to the other side, it’s not at all what they were expecting. To say much more about the plot would be to give away an epic story that Nolan (and his brother/co-screenwriter Jonathan) allow to unfold slowly. There are moments early on that may seem like they could be cut but which pay off in the film’s final act. "The best science fiction movie you're likely to see this year!" Many reviewers will focus on the film’s visuals, since that’s what they expect from science fiction movies. While the journey through the wormhole may remind you of the trip through Kubrick’s monolith in 2001, what’s much more imaginative are the alien surfaces they explore. A good deal of thought has gone into avoiding clichés, so that even the robot sidekicks are unlike anything you’re likely to have seen on screen. The performances are solid with most of the weight of the film on McConaughey, but nice turns by Anne Hathaway, Wes Bentley, David Gyasi, and Matt Damon as astronauts, Michael Caine and John Lithgow as a scientist and Cooper’s grandfather respectively, and Jessica Chastain and Casey Affleck as Cooper’s grown children. However, this is not a film about character for the most part. It’s a film about relativity… and that’s what’s going to baffle some viewers, even more than Nolan’s Inception did. 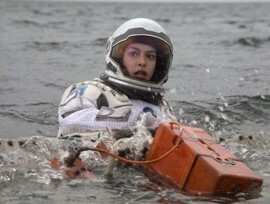 Time moves differently for the astronauts than it does for the people back on Earth, and the nature of time is one of the key questions of the film. Ironically, for those who have no problem with that, the stumbling block may the film’s other key theme which is the bond between parent and child or, more specifically here, fathers and daughters. That mixture of mind-boggling ideas interlaced with real human emotions has been a hallmark of Nolan’s films, and is one of their strengths, even if some only appreciate one side or the other. Interstellar is a masterfully paced space odyssey that tackles big issues but doesn’t forget that it’s individuals with their own personal histories who are engaging with them. We’ll have to wait to see what people think of this in ten years, but right now it’s the best science fiction movie you’re likely to see this year, and quite possibly one of the best films period.